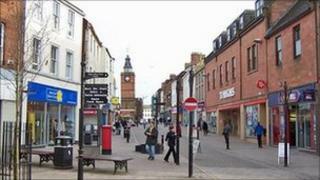 The head of Dumfries Retailers Association has said pre-Christmas trade in the town is down on last year. Rab Smith said local figures reflected a national downturn in sales of about 4% compared with 2009. He said the extreme winter weather had had both positive and negative effects on trade in the region. With just a few shopping days left before Christmas, traders were still hoping for a late surge in business to boost overall figures. "Some people have stopped their shopping trips to Glasgow, Edinburgh and Newcastle because of the weather," said Mr Smith. "We have retained some of the local people in the town. "But the weather has been so bad that a lot of people haven't been coming out at all, except for their food shopping." He said it appeared people had panicked about conditions and decided to stock up on provisions without visiting other stores. Mr Smith said a downturn of 4% was "fair estimate" of the situation facing traders in the town. Dumfries 'ghost town' tag deserved or not?